Description: CN westbound at Kingston, Ontario just ahead of a big storm. Description: The local switchers switch CN's London yard. 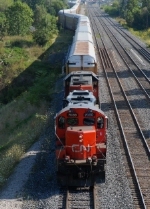 Title: CN 439 at Mile 5.8 Strathroy Sub. Description: Two zebra stripes lead 439's train up the CASO crossing Cabana rd. 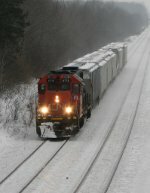 CN has been keeping two geeps on this train for several months now. Description: CN 4710 and CN 7080 passing under the signal rack with a relatively short consist of seven cars on the CN York Subdivision.